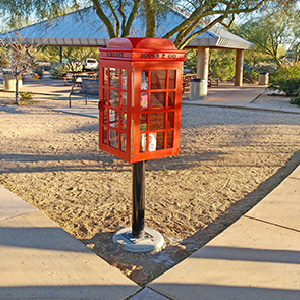 The Books2Go little library structures will be located in City of Scottsdale parks and other city locations. 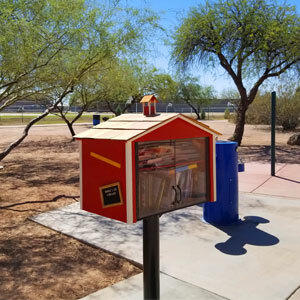 Designed by the Scottsdale Public Library, this project is a joint venture between the Facilities and the Parks Departments. Each Books2Go structure is iconic, built to reflect the location or a theme. Our first Books2Go is a mini library doghouse designed and built by Encore fellow Jim Nance. Books2Go wants to get books into your hands – no matter where you are- playing with children at the park, walking your dog, or standing in line for a passport. The unique mini-library structures that hold the books are placed in convenient locations so that you can pick up a book to read or contribute a book that you have finished. Currently, there are three Books2Go locations. 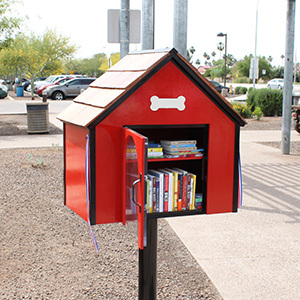 There are plans underway for at least two more micro-libraries around Scottsdale. You can donate books to help us keep the little libraries stocked full. Just take your donations to your local Scottsdale Public Library branch and tell them the books are for the Books2Go project. If you only have one or two books – go ahead and put them directly into the micro-library for others to use.